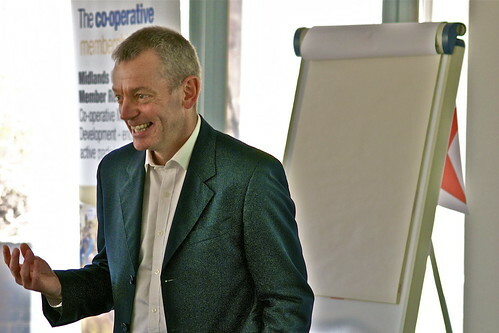 There was an overriding theme of electricity at the annual general meeting of Co-operatives West Midlands, in the form of two very different guest speakers. The keynote speaker at the AGM was on-hand to talk about Co-operative Energy, the newest player in the residential electricity and gas supply game. 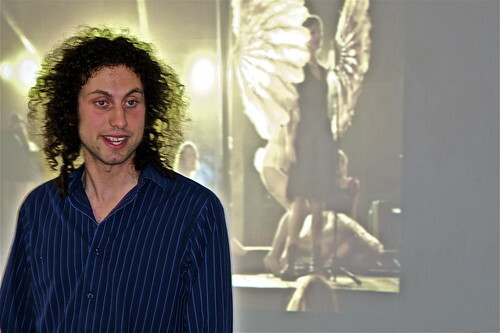 And in an afternoon session, the founder of the Electric Swing Circus, which fuses big band music with circus skills and burlesque dancing, talked about the place of co-operatives in the arts as part of the associated Creative Co-operatives event. Addressing co-operators from across the West Midlands at the freshly-refurbished Midlands Arts Centre in Birmingham, Co-operatives West Midlands chairman Nick Matthews relived an exciting year for the movement in the West Midlands. “Telford has become a hotbed of co-operative enterprise, with the Tigers ice hockey club and AFC Telford both in community ownership,” said Nick. Introducing “one of the most exciting things in the co-operative movement,” Nigel Mason, business development manager of Co-operative Energy explained why Midlands-based Midcounties Co-operative – the UKs second-largest co-operative, had decided to move into the highly competitive energy market with a product offered nationwide. 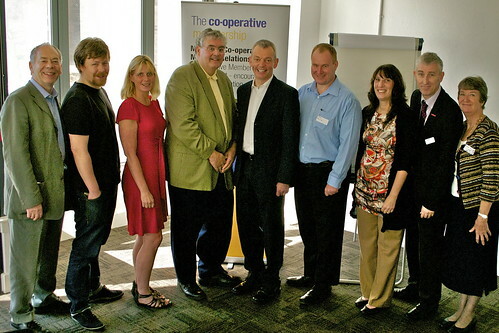 Nigel revealed that Co-operative Energy – which launched in May 2011 and already has over 14,000 customers, had intended to enter the market on a green agenda, but after public consultation had concluded that price needed to be its number one consideration. He said that Co-operative Energy was already the second largest renewable energy supplier in the country after Good Energy. Its sourcing policy included buying power from the co-operatively owned Westmill Wind Farm in Oxfordshire, and it planned to support other suppliers of renewable energy, including community-owned initiatives. And he revealed that in its bid to add a seventh supplier to the ‘big six’, Co-operative Energy is looking to move into the small business market, where many firms has been locked into fixed contracts, and that a pre-payment meter tariff was to be launched, offering for the first time the same tariffs to meter-users – often the poorest households – as those on direct debits, who traditionally get a better deal. During the afternoon session, another electric co-operative took centre stage as Tom Hyland from Birmingham’s Electric Swing Circus – billed as the UK’s newest performance co-operative – explained why his band had decided to set up as a co-operative. Tom was addressing Creative Co-operatives, a workshop for practitioners in the creative industries or people thinking of a career in the sector who might want to work in a co-operative way. Electric Swing Circus, said Tom, was breaking the music industry mould by allowing everyone involved in the band – from musicians, circus performers and burlesque dancers to choreographers, lighting and sound engineers, and photographers and film-makers – to have a say in the running of the business and to enjoy a share of the profits. Workshop delegates, who included artists and artisans, musicians and producers, graphic designers and fashion students, heard from Jo White and Jim Pettipher of event sponsor Co-operative Futures about the best ways in which the flexible co-operative business model could suit their organisation, and how help and practical advice in forming a co-operative was available from co-sponsor the Co-operative Enterprise Hub.